Takeaway: The keys to building consumer trust over the quality and performance of products in an age of heightened consumer doubt and skepticism are refreshingly simple. Laying the foundation with straightforward, polished product content supported by user-generated reviews will ultimately turn trust into loyalty. Doubt is a powerful dissuader, especially to someone with a digital shopping cart full of products. At the core of cart abandonment, which results in a loss of over $4 trillion in sales each year, is the lack of a consumer’s experience with the brand or retailer. In other words, the trust isn’t there. And with good reason. Rows and rows of similar products with nearly identical product content confront consumers with every search. So, what’s the deciding factor between one lawnmower or the other? Trust-building tools like user-generated content and clean, consistent details. The fact that 87% of U.S. adults prefer at least three product reviews when shopping is a clear indicator of the consumers’ quest for non-marketing, non-promotional truth. As Forrester reported based on 58,000 respondents, “46% of online adults trust consumer-written online reviews, while just 10% trust ads on websites.” In other words, pay to promote all you want, but more consumers rely on the genuine, first-hand assessments other shoppers than marketing from the brands themselves. Ignoring negative shopper-written reviews is tempting, but consider this: Staying mum can affect Net Promoter Scores or other experience surveys. For example, even if the product review is negative, Crate and Barrel responds directly to the consumer with an email indicating the feedback has been passed along the merchandising team. Upon seeing a ‘tpyo’, what comes to mind? Sloppiness. Lack of attention to detail. Carelessness. 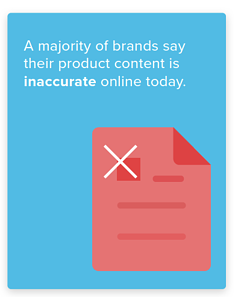 When consumers come across an error, they figure, ‘Why should I trust this product, if the brand or retailer couldn’t even take the time to tighten up their details, and ward off grammar, spelling, and punctuation errors or broken links?’ Heed this warning, because when the trust in the product content wavers due to inaccuracies, 94% of consumers are unlikely to complete the purchase. Consumers noticed the darnedest things, like when a running shoe mentions the 12mm drop on the website, but neglects to include it on the mobile app. Or worse, when it says 12mm drop one place and 8mm in another for the same product. Most consumers, about 76% of them, have noted inconsistent product content across different channels, and in our distributed commerce, omnichannel world, this attention to detail is more important than ever. By not taking the requisite time to deliver an outstanding content experience, could you inadvertently drive trust toward a competitor? When a consumer compares the robust, accurate details of one retailer to the sparse details of another, they most often complete the transaction where the best information is provided. Visuals are critical. Nearly 66% of consumers expect to see at least three photos. Trust will wane if clothes appear ill fitted, clamped too tightly, or otherwise altered by stylists. Consumers think, “If this garment doesn’t even look good on the model, how will it look on me?” For product shots on white background, if the photos look doctored, like the chairs are bigger in scale than the matching dining table, consumers will move onto the next option. Many big retailers are doing this well – Amazon, Kohl’s, Overstock – and if you look at the sheer number of questions being asked by consumers, it’s clear this may be the most voluminous form of direct consumer engagement today. Want more practical suggestions on how to create effective product content? Download The 11 Rules to Deliver Product Content that Sells.